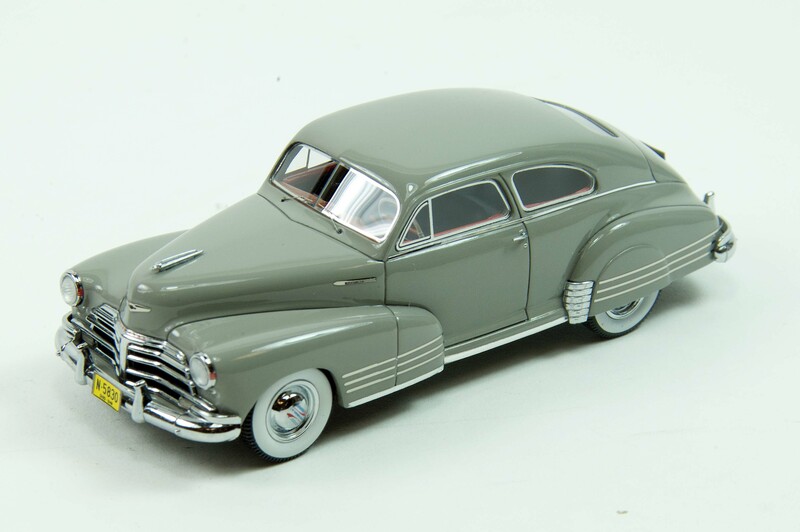 1948 Chevy Fleetline Aerosedan a slick family sedan . . .
Cars that bridged the gap between pre-war America and post-World War II are an interesting lot, often dowdy and pedestrian of styling. Most consider the 1930s and 1950s as primo styling eras. 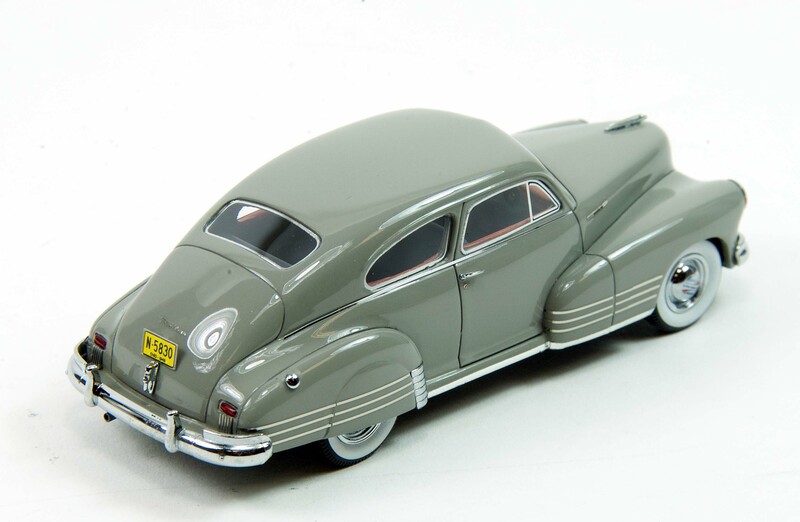 But Chevrolet’s hot-selling Fleetline series, starting in 1941 is an exception, particularly its sleek streamlined looking Aerosedan, a two-door family car with a fastback design that looks slick still today. 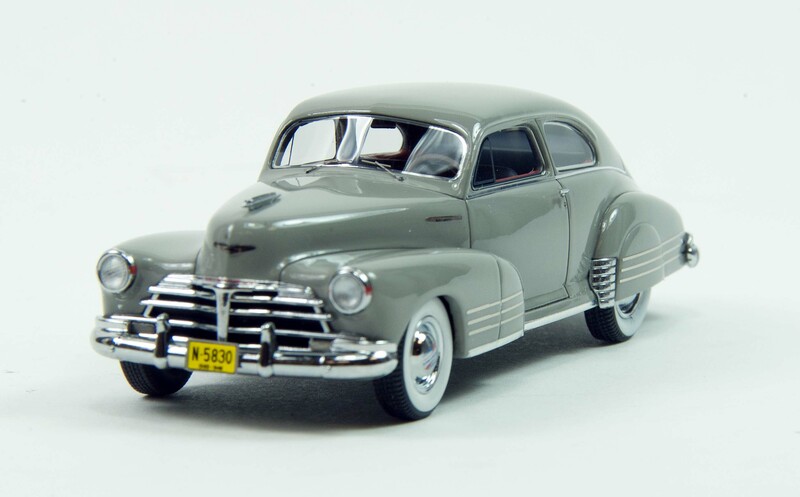 That’s the 1948 Chevrolet that NEO has produced in 1/43 scale, a somewhat sporty full-size car that GM began cranking out for the 1941 model year, just before converting its car plants to war machinery. And for the 1946-48 model years they cranked up the assembly lines again using the satisfying 1941 design. 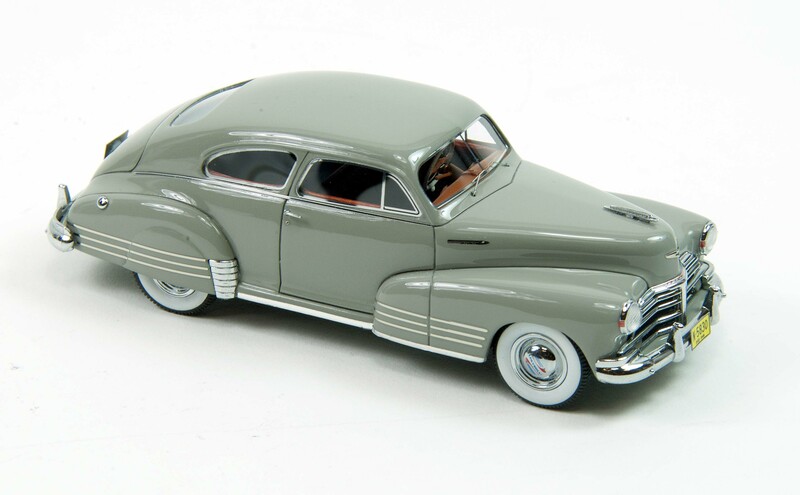 Look at a four-door Fleetline and you’ll quickly see why the two-door Aerosedan and its smooth curves was such a hit. Blah describes the former, but Chevy knew it had a winner with the Aerosedan. In 1948 it sold 211,861 of the cars vs. just 64,217 of the four-door. Of course the baby boom hadn’t quite caught on just yet either. The car, which was a sub-series of Chevy’s Fleetmaster, featured a Chevy Blue Flame 216 cu.in., inline six engine that created 90 horsepower. That meant the car was no slouch. It could hit nearly 80 mph. 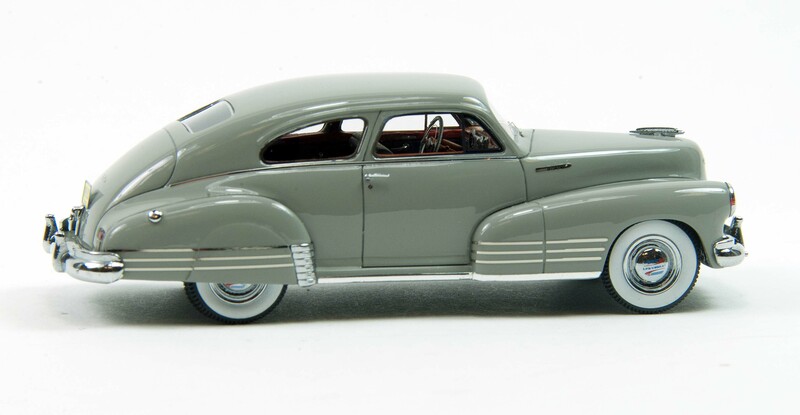 The Fleetline rode on a 115-inch wheelbase, about three inches longer than the current Chevy Impala, and was 197 inches long, about four inches shorter than today’s Impala. Bottom line, it was nothing fancy, but looked good, with good power and was reliable. If you’re a Chevy guy, it also wasn’t a Ford! 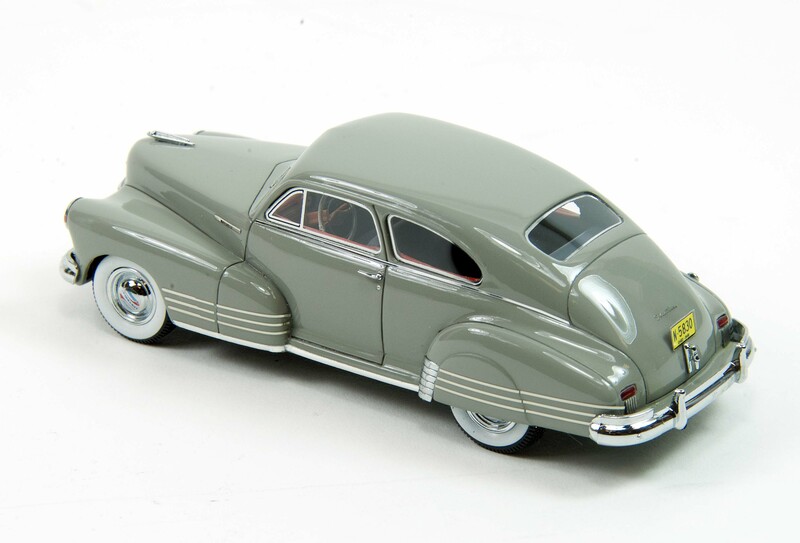 NEO’s resin bodied Aerosedan is beautifully shaped and perfectly reflects the smooth lines of the sedan, plus hood, trunk and door seams are all stellar. This tiny Chevy also includes all the chrome trim as seen on the original. That includes three thin chrome styling strips flaring back from the front wheel well and along the rear fender to the taillights. Bumpers are chrome too and include dual raised guards front and rear. There’s a chrome Chevy hood ornament along with all window trim, including vents and the flat split windshield. Door handles, gas filler cap, headlight bezels, wipers, trunk release and grille are chrome. I like the fine detail of the photo-etched Fleetline logos along the hood’s sides, the script name on the trunk and winged Chevy logo on the nose. Head and taillights are fine too and there’s a yellow Ohio license plate front and rear. Broad whitewall tires treaded tires with large chrome hubcaps put the car on the road. Those caps are the fancy Chevy models with painted red swooshes (sorry Nike, Chevy beat you) and Chevrolet in blue too. Cool! Inside is a reddish brown dash and door trim that really sets off the gray bench seats in the interior. The dash top doesn’t look as metallic as it might, but the color is nicely mated to the car and the dash face looks authentic, including a giant clock in the glove box door. This was a wind-up clock that would run for a week on one full wind. The speedometer is similarly large and visible, of course the side windows are all up, which does slightly limit your taking a peek inside. NEO creates a fine two-spoke cream steering wheel with horn ring, and the steering column and hub match that reddish brown dash color. Sharp! A cool addition to the model would be a green translucent sun visor like so many of these have worn over the years to keep the sun from reflecting from what was a metal dash. Maybe on a future model!